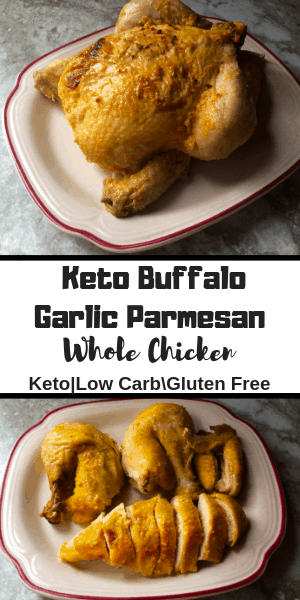 Keto Buffalo Garlic Parmesan Whole Chicken is one of my favorites. 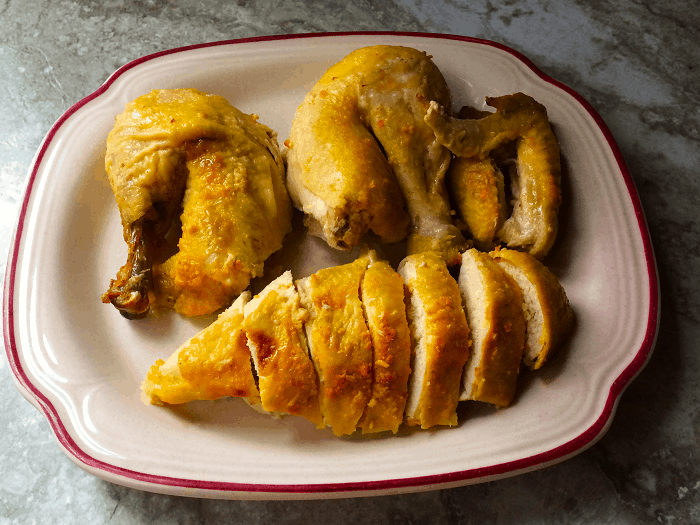 I did this same kind of recipe with chicken wings as well and I loved that recipe so much, therefore I had to see if it would be good on a whole chicken. It is so good both ways, after all, how can you go wrong with garlic, hot sauce, and parmesan cheese? 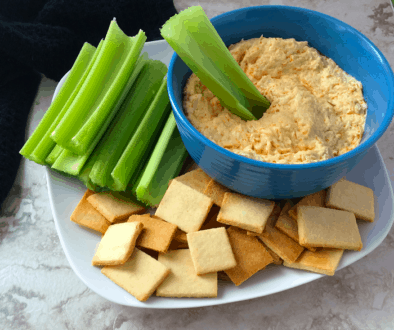 It is such a wonderful combination I discovered how much I loved when I created these recipes. 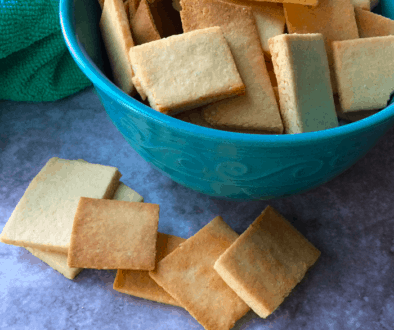 This is a super easy recipe with only a few minutes of preparation. Then just pop it in the oven to make a delicious dinner for the whole family or to meal prep for the week. 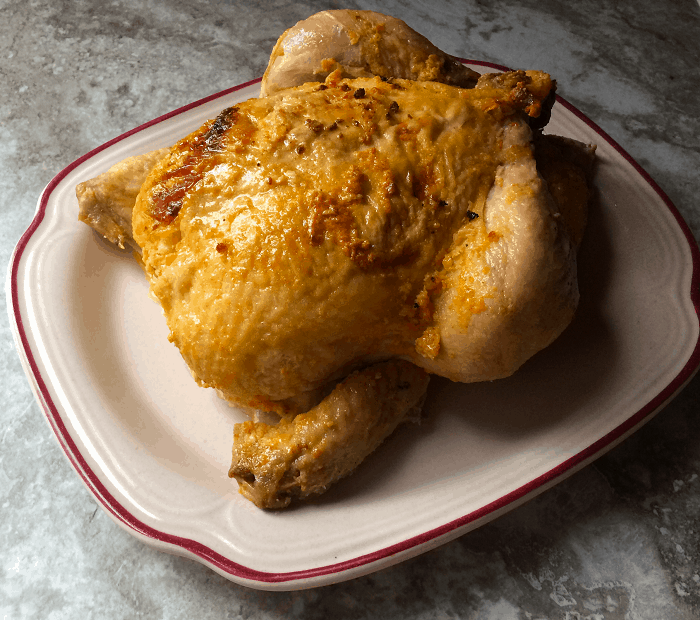 Either way, this Keto Buffalo Garlic Parmesan Whole Chicken is a winner that I am sure will become part of your usual dinner rotation. It certainly will be for us. Pair it with a vegetable or salad and dinner is done. I bet the bones would make great bone broth, although I have not tried this yet. If you do this let me know how it comes out. If you like this recipe you may also like our wing recipe. This is a delicious dinner for the whole family or meal prep for the week. It is a whole chicken in the flavors of chicken wings. It is so yummy why have it just for wings. In a bowl, add room temperature butter. To the room temperature butter add hot sauce, garlic powder, minced garlic, parmesan cheese, salt, and pepper. Mix until well incorporated. In an oven bag, add coconut flour and shake to coat the inside of the bag. This will prevent the bag from bursting during cooking. Place the rinsed whole chicken (patted dry with giblets removed) into the oven bag in a roasting pan. Starting at the neck end, slide your fingers under the skin of the breast to loosen the skin from the breast to form a pocket. Be careful not to rip the skin. With either your hand or a spoon, put half of the softened butter mixture between the skin and the breast meat. Rub the other half of the butter mixture over the outside of the chicken. Close the bag securely with the ties that came with the oven bag. Cut six ½ inch slits in the top of the bag, this will allow steam to escape from the bag so the bag won’t burst during cooking. Tuck in any loose ends of the bag into the roasting pan. Bake for about 1 ½ hours (or until a meat thermometer placed in the thigh reads 170 °F or until the juices run clear when pierced). If it did not brown in the bag you can cut open the top of the bag and return to the oven for a few minutes to brown the top of the chicken. Let the chicken rest 10 minutes before serving.